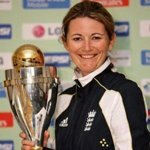 Charlotte Marie Edwards MBE (born 17 December 1979 at Huntingdon, Cambridgeshire) is an English cricketer and current captain of the England women's team. At the time when she made her England debut in 1995, she became the youngest player ever to play for England (later bettered by team-mate Holly Colvin). In 1997 she smashed 12 centuries, including one off 118 balls against the touring South Africans. The day before her 18th birthday, she scored a then-record ODI score of 173 not out in a World Cup match against Ireland. In 1998-99 she scored her maiden Test hundred against India but, while still scoring runs, fell below expectations. In 2000, she was sidelined by a serious cruciate ligament injury sustained while playing hockey causing her to miss most of the 2001 season. In 2005 she stepped up from her role as England vice-captain to take full charge of the side when Clare Connor was injured, and was appointed full-time when Connor retired in March 2006. She plays her county cricket for Kent, whom she captains. She played her 100th one day international on tour in Australia and led her team to victory in the one off test match at Bowral to retain the Ashes, scoring 94 in England's first innings and hitting the winning runs in the second. She won the ICC Woman's player of the year 2008 at the ICC awards ceremony at Dubai. She led the England team in the 2009 World Cup in Australia, scoring a half century and taking a career best 4 for 37 in the Super Six victory over New Zealand before captaining the side to a 4 wicket victory over the same opposition in the World Cup Final in Sydney. Edwards was appointed Member of the Order of the British Empire (MBE) in the 2009 Birthday Honours. She led England to victory at Lords in the final of the World Twenty/20 championship in June 2009. She scored 139 runs in the tournament, the third highest total, and took 4 wickets at 14.5 apiece, before recording an unbeaten half century in the second innings to help England retain the Ashes with a draw in the one off Ashes test at New Road in Worcester.